The "Star Wars" Facebook page just epically clapped back at haters dissing Rose in "Last Jedi"
If the Resistance is looking to recruit a few new members, a good candidate might be the Star Wars Facebook page. Just like the Resistance, they fight for and stick up for those in need, especially when it’s about one of their own. 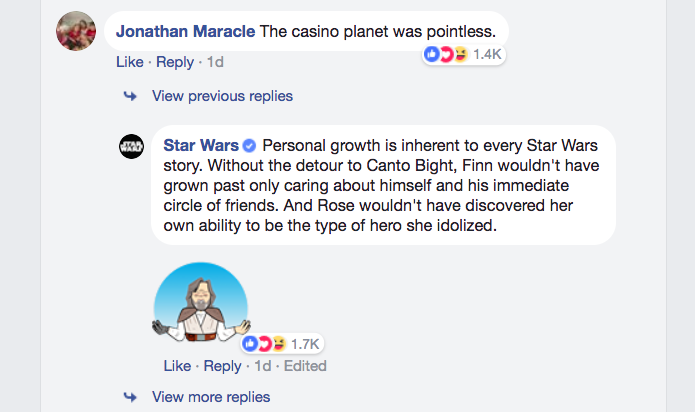 A few commenters recently took to the Facebook page to say some not nice things about darling Rose Tico, and the Star Wars Facebook page was having none of it. Thanks for being the hero we need and deserve, the official Facebook page for Star Wars. As you’re probably well aware at this point, many are divided over The Last Jedi. There are some who loved it (LIKE ME) and there are some who downright hated it. TBH, to each their own. 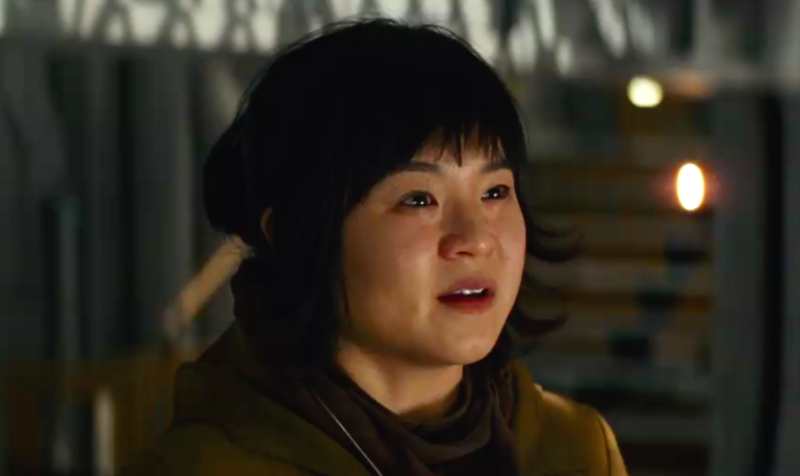 But just because you didn’t like a movie doesn’t mean you gotta start dragging Resistance hero Rose Tico through the Canto Bight mud. After posting a video of Kelly Marie Tran’s chemistry read with John Boyega (who play Rose and Finn, respectively), the feed was suddenly flooded with those calling Rose anything but a hero, and claiming that the Canto Bight scene was pointless, and blah blah blah, cool story, guys. Nice use of a Darth Vader quote, SWF. The page also shut down someone complaining that the casino scenes were absolutely pointless. If you’re looking to argue with someone about the movie, better turn to your friends, family, or other places on the internet, because those who fight the First Order together, stick together. Star Wars‘ other Facebook page also isn’t hearing this. 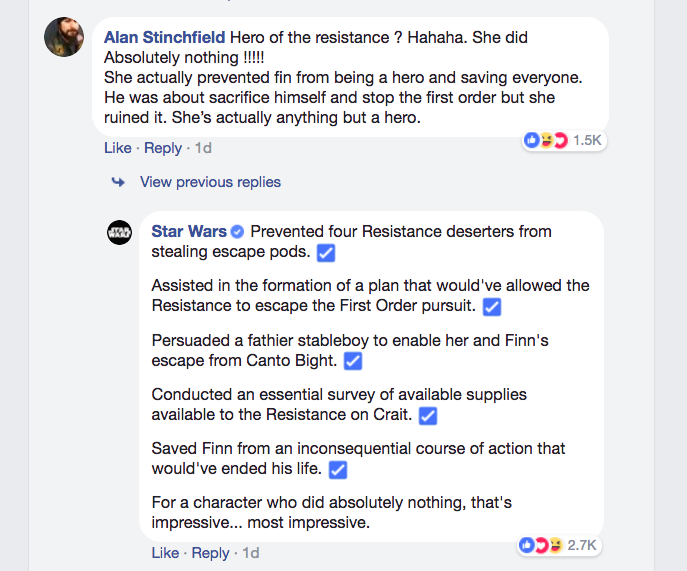 So think what you will about Last Jedi, and Rose’s Big Resistance Adventure, and don’t go trying to fight the Star Wars Facebook page on it. That argument is not going to go the way you think.